Horleys - Horleys Elite Mass Specialised Mass Muscle Gain Protein. To increase weight, use in and between meals. To boost the energy value of your Mass shake, add other foods such as a banana, yoghurt or an egg. To restore muscle tissue and depleted energy during recovery, the best time to consume Horleys Elite Mass is within 30 minutes after your workout preferably in milk or another carbohydrate source. This will flood recovery pathways, restore depleted creatine & glycogen stores and ignite muscle repair and growth. Mass Protein Blend (Whey Protein Concentrate, Whole Milk Powder, Milk Protein Isolate), Maltodextrin, Medium Chain Triglycerides, Flavour, Creatine Monohydrate, Magnesium Oxide, Sweetener (955), Digestive Enzymes. 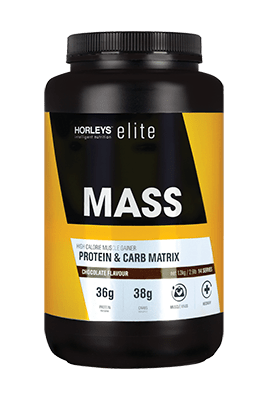 Horleys Elite MASS is the original anabolic formula for gains that offers all the nutrients you need in a specialised mass-gainer. Anabolism is when your body utilises available reserves of energy for repair and growth. This includes building muscle tissue, growing new cells and recovering from exercise. For your body to effectively repair and grow new muscle tissue, protein plays an important role. We use a combination of whey protein concentrate (WPC). milk protein isolate and whole milk powder in MASS to ensure an effective amount of protein. This ensures that your body gets what it needs with no wastage. The WPC used in Mass goes through a strict ultra-filtration process and contains 80% protein once dried. Whey protein concentrate is a high quality, fast-absorbed protein that is easily digested, meaning less stress on the digestive system as well as having high bioavailability, which means that compared to other sources of protein more of it is absorbed and used by the body. It also contains higher amounts of the branched chain amino acids needed for muscle growth. Milk proteins provide intact whey and casein proteins, i.e. whey and casein that haven’t been separated. Casein is a slower release protein, which provides anti-catabolic protection over a longer period of time. Milk proteins such as WPC, milk protein isolate and whole milk powder have also been shown to contain various compounds that have many nutritional benefits, including for immune health. With creatine, Mass helps increase performance and build muscle. Creatine also draws water into your cells, making your muscles look a little bigger. The energy dense medium-chain triglycerides (MCTs) in Mass boost the calorie count but are metabolised like carbohydrates, therefore minimising fat storage potential. BEST FOR: increasing weight, size and strength gains, enhanced training recovery, supporting weight graded sports, maintaining body weight and sizing up. Ultimate combination of protein, healthy fats and complex carbs to support muscle gain, strength improvements and enhanced recovery. An ideal combination of whey protein concentrate (WPC), milk protein isolate and whole milk powder delivers the ultimate protein combination for hardgainers. WPC is a high quality, quickly digested protein ensuring fast delivery of amino acids for muscle growth. Milk protein isolate and whole milk powder are digested slowly ensuring delivery of nutrition to muscles for longer. Multiple sources of protein, together with complex carbs and MCTs provide quality nutrients and high calorie content which support workout performance and recovery from intense training. Includes magnesium which is essential for normal energy metabolism, protein synthesis and muscle function. Medium Chain Triglycerides (MCTs) boost calorie density and are rapidly absorbed to provide energy. They are metabolised like carbohydrates, providing direct fuel and minimizing fat storage. Creatine helps enhance your performance, which helps build more muscle. It also draws water into cells making your muscles look bigger. The complex carbohydrates in Mass, deliver a steady source of energy ensuring you have the fuel you need to recover and make epic size gains. Perfect for post workout. FLAVOURS: Vanilla, Chocolate, and Banana (2.5kg only). SIZES: 1.3kg (14 servings) and 2.5kg (27 servings). How long will it take to see results when using your products? Depending on your goal the positive effects of using Horleys supplements can become apparent in as little as two weeks. There are no typical results, however, and our supplements will work in many different ways depending on the individual and their goals. The results you achieve and the time it takes will ultimately rest with you and how you manage your lifestyle, eating and exercise/training plans. See our Goals pages for some tips and appropriate products to help you maximise your results. I can’t gain weight, what can I do? For people with naturally lean body types, weight gain can be very difficult. Weight gain means your calorie intake needs to over-compensate for the energy you use. This is more easily achieved by eating six to seven smaller meals per day. This will ensure that your system is constantly drip fed nutrients for maximum efficiency while preventing the fullness and discomfort associated with large meals. Your diet - that is, what you normally eat, even before you think about using any form of supplement - is critical. You must get enough calories by eating a wide variety regular foods (lots of wholegrain cereals/rice/pasta and breads, fruit, vegetables, lean red and white meats, fish, nuts and seeds, plenty of low fat dairy) - there are no shortcuts, and a protein powder won't help unless your baseline nutrition plan is adequate. You have to eat a really good breakfast, lunch and dinner every day, with healthy snacks in between. Once your base diet is sorted, a nutrient-dense supplement such as Horleys LeanGain, Huge, or Elite Mass will help boost the energy density of your diet. These are formulas that can help provide extra carbohydrates, protein and nutrients in a convenient format. It is important that you add this on top of your existing diet and not eat less of other foods. Use it after you done some exercise and as a between meal snack. It may also be helpful to have a serving approximately one hour before you go to bed.